The Nokia brand's smartphone maker HMD Global is scheduled to host a launch event in India on October 11. For this, the company has sent the invoice to the media. By the way, the company has not yet made it clear what will happen in this event. 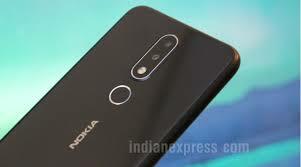 But there are speculations that the Nokia brand of Nokia 7.1 Plus or Nokia X7 is likely to be launched in India, which can be launched in London on October 4. If these ideas prove to be true then it will be the third smartphone of Nokia's X or Plus series. Prior to this, Nokia 5.1 Plus and Nokia 6.1 Plus have been launched which are available in the Indian market. Last week, this phone was listed on the Chinese certification site, Tina. According to the TENAA listing, Nokia 7.1 Plus has a 6.18 inch full HD + (1080 × 2246 pixels) TFT display. 2.2 GHz octa-core processor (Qualcomm Snapdragon 710 chipset) can be given for speed and multitasking. It can have two variants - 4 GB RAM / 64 GB storage and 6 GB RAM / 128 GB storage. With the help of MicroSD card in both variants, the storage can be increased to 400 GB. According to the listing, a 20-megapixel front camera has been given for Selfie. Two rear cameras have been provided for photography, the primary sensor of 13 megapixels and a secondary sensor of 12 megapixels. There is a battery of 3,400 mAh for power backup.